As it was FA Cup 3rd Qualifying Round day I was determined to see a game in my favourite competition. By far my first choice was AFC Fylde v Coleshill Town as I wanted to visit the hosts ground before they moved if possible. Also I had seen Coleshill twice before in previous rounds and liked the idea of carrying on the 'chain' However my fellow hopper Anwar could not be persuaded to undertake such a long journey and so we looked for something closer to home. Blackfield & Langley and Brockenhurst were considered and although their ties against Maidenhead and Wealdstone respectively looked more interesting, we decided to go for the best ground. Visitors Poole Town were also a ground that I was yet to visit. However a visit to the replay was out of the question as I will be at Marine next midweek. 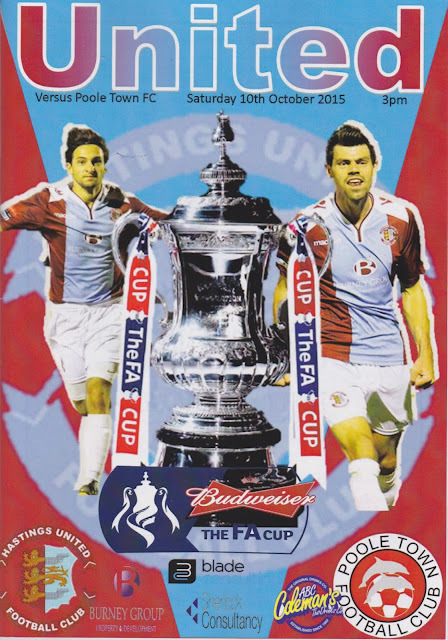 I had initially tried to visit Hastings Town during their FA Cup run in 2012. The replay at home to Harrogate Town was made all ticket, but they were unwilling or unable to post tickets out to me. The club were founded in 1894 as Rock-a-Nore. 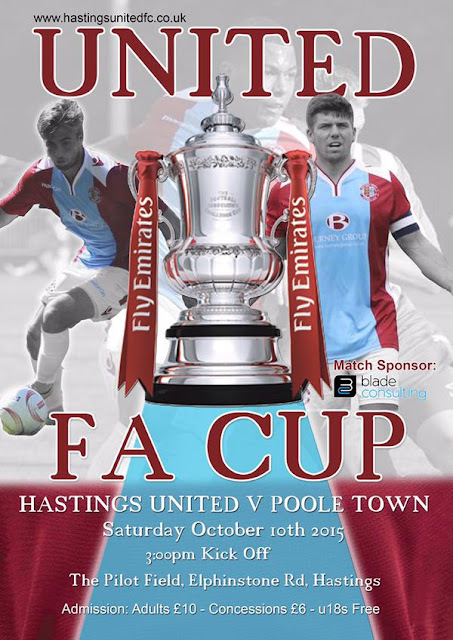 They have also been known as St Leonards, Hastings & St Leonards and Hastings Town during their long history. The history is quite confusing as another Hastings United played in the Southern League for around 40 years up until 1985. 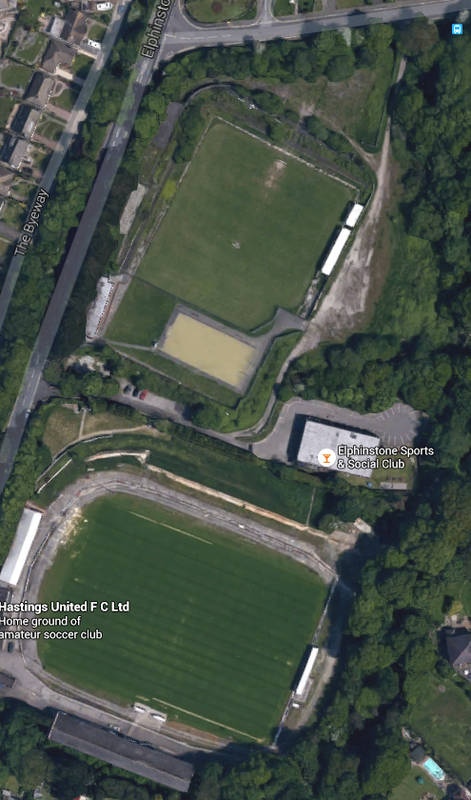 This club played in the Sussex Leagues of their history but in 1985, the 'old' Hastings United, who had been finding things tough for some 15 years and finally folded and gave up their lease on the Pilot Field ground. This meant a return to the stadium they had vacated in 1948. It was only a short move as they played next door at 'The Firs' which was then used for St Leonards FC, up until their demise in 2004. As well as getting their ground, they also took their place in the Southern League, albeit at a division lower, following objections from another club. Starting in the Southern Division 1985-86 was an excellent debut season, with them finishing 3rd. However it took them up until 1992 to earn promotion to the Southern Premier when they went up as champions. They stayed here up until 1999 when despite finishing in 5th place they entered administration despite being funded by local lottery winner Mark Gardiner. There must be something in the water round there, as another local lottery winner Mick Maplesden stepped in to save them, though they had to drop back down to the Southern League Eastern Division. By 2002 they were back in the Southern Premier, having once again won the league. However their joy was short lived, as despite a run to the FA Cup 1st Round, they were relegated after finishing in 20th place. Under another new owner, this one having slightly less luck on the lottery they only just escaped a second successive relegation after another season of struggle. Following the reorganisation of the non league pyramid, they were transferred to the Isthmian League for the following season, 2003-04. A mid table finish of 11th was a big improvement on the previous season and by 2007 they were promoted to the Isthmian Premier. After finishing in 4th place, they beat Dover Athletic and Tooting & Mitcham in the end of season playoffs to secure their promotion. 6 seasons were spent here, with a best ever finish of 7th in 2010. Despite this, 3 years later they were relegated back to Isthmian Divsion 1 South and despite making the playoffs in their first season, have remained there ever since. That relegation season of 2012-13 also saw their best ever FA Cup run, with them reaching the 3rd Round. Starting in the 1st Qualifying Round they beat Chatham Town, Staines Town, Hitchin Town, Blackfield & Langley, Bishops Stortford & Harrogate Town to set themselves up a tie against Middlesbrough. That second round tie against Harrogate went to a replay after the two sides drew 1-1 up in Yorkshire. 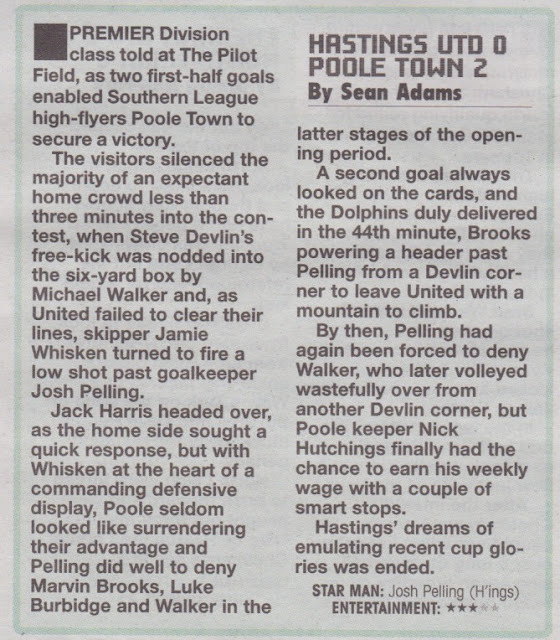 A capacity crowd of over 4000 at the Pilot Field saw the sides still locked at 1-1 after 120 minutes of football and Hastings triumphed 5-4 in the resulting penalty shoot out. Though they would go on to lose 4-1 at Middlesbrough's Riverside Stadium they gave a credible performance and Bradley Goldberg's stunning goal will live long in the memory of all those Hastings fans who saw it, Goldberg also had a goal disallowed and hit the post while keeper Liam O'Brien was also a hero with a penalty save. The town of Hastings is well known for it's battle many years ago in 1066. Economically it's biggest trades come in fishing and tourism. Many films & TV programmes have been filmed there, most well known is the ITV drama 'Foyle's War' Many famous people hail from the town - footballers Kevin Ball, Gareth Barry & Neil Ruddock were born in the town, as were TV star Harry H Corbett and the inventor of television John Logie Baird. The town's Wetherspoons pub is named in his honour. 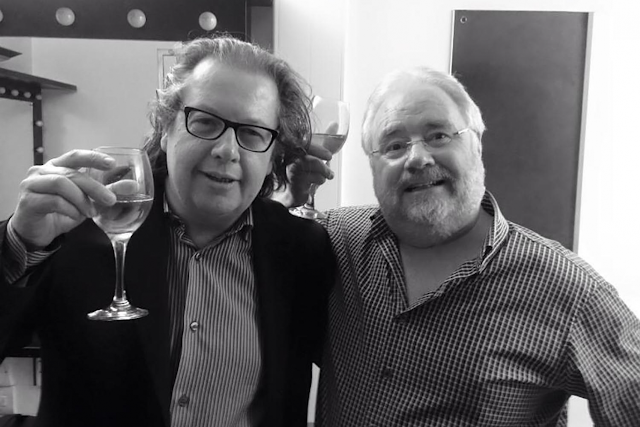 These days it is home to many famous people, including Mike Graham, one half of my favourite radio show The Two Mikes. The night before I had watched England beat a resilient Estonia side 2-0, having a few drinks in the process. As a result I went to sleep at 10.30, waking up early on the day of the game just before 6am. I played on my FM15 save, watched some Youtube videos and had a bath before leaving just after 10am. I stopped at Chiltern Brewery to get a few bottles of local cider before going onto another local shop to get some snacks for the game. I met Anwar just after 11 but it was a slow and frustrating trip down to Hastings, thanks to delays on the M25 and the A21 as well as selfish dawdlers on the local roads. 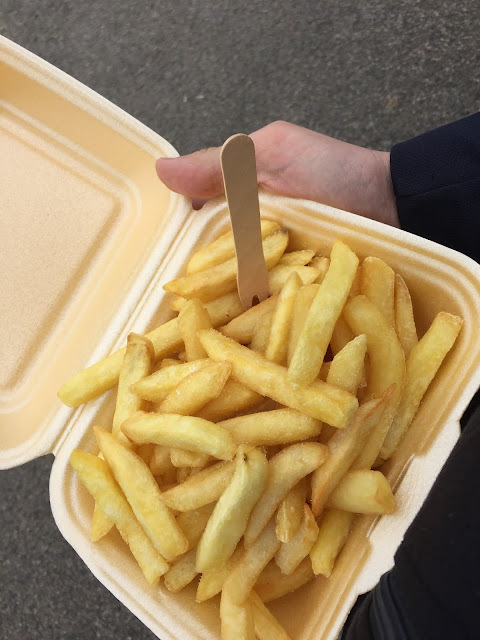 We got to just outside Hastings at 1.50 and my intention was to get something from a takeaway called MFC as they did Mexican food. But they had not opened up despite advertising as being open from midday and with the other places nearby being uninspiring and overpriced I didn't bother. Anwar hot himself a donner wrap for £5.60 though. 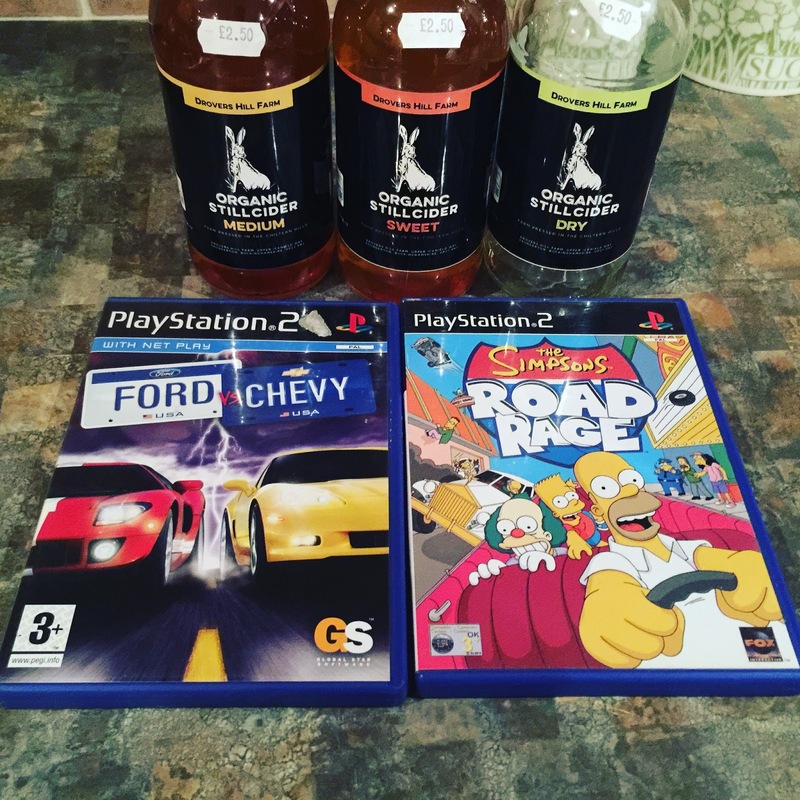 At least I got a couple of PS2 games for a quid each from a local shop. From there it was only 10 minutes to the ground. After parking up in a side street we paid an above average £10 entry which is quite a lot for step 4. But having travelled so far it wasn't too much of an issue. I also bought a programme for £2, pen for £2 and a local charity scratchcard for £1. Food and drink wise I got a pint of Somersby for a very reasonable £2.80 and a decent portion of chips for £2. I chose a space opposite the main stand to watch the game from. Before the game I read the excellent programme. 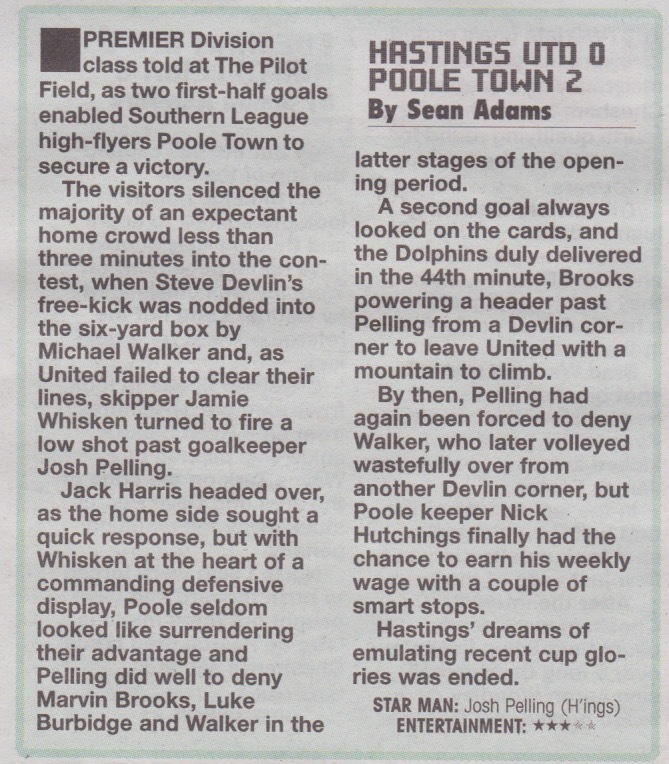 As for the game, it was no classic - pretty much a routine win for Poole Town - the report from the Non League Paper is below. After the game we went and had a look at the old St Leonards ground next door where the pitch was fine but the stand was all derelict. On the way home I connected my phone to my car bluetooth and listened to BBC Radio Kent, seeing as they make such a good effort to cover their non league sides. It was deep joy for their local sides - especially Bromley who had trounced Barrow 5-0. Quite a few of my pals from up there had attended the game and the poor sods will have a long and unhappy trip back to Cumbria after their team let them down badly. After dropping Anwar off I got home at 7.40, watching the Wales game with a few ciders while chatting on Facebook. THE PILOT FIELD is a proper classic non league ground and one that every groundhopper should visit. The main stand is pretty large with a capacity of around 800. The near end is a large terrace, holding up to 1000, while the far end is a smaller terrace and holds around half that. The far side is open hard standing, with the overall capacity being 4000. The bar and tea hut are fairly decent, which is good, as the town is a good mile walk away. The club shop is also excellent, with a wide range of merchandise and old programmes and magazines too. Overall pretty much everything you need for a nice day out.